The LX200 Classics are fairly old now. A little maintenance can be worthwhile. 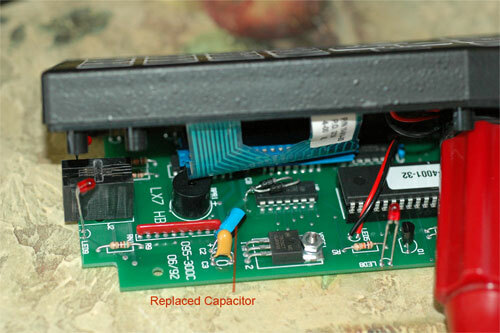 One of the most important items is the capacitor in the Controller. This is the one that can cause the biggest problem. 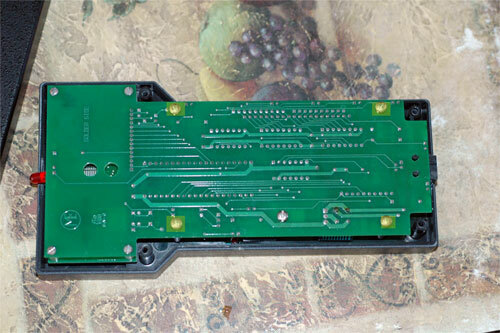 If you think your controller is bad due to a capacitor burning out, that can be a problem if it melted the internal ribbon cable. If you open up your controller you can get an idea if it is damaged. First remove the 4 phillips screws on the back of the control paddle. 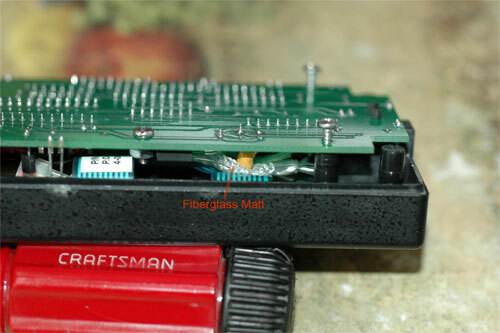 Inside you will see the back of the circuit board. Remove the 4 phillips screws I have highlighted. You can then partially separate the back circuit board, and you can see in my picture the replacement blue capacitor I installed in position C2. If the ribbon is not damaged, replacing C2 should be done. As you can see in my last picture, I put a piece of fiberglass between my replacement capacitor and ribbon for future protection. 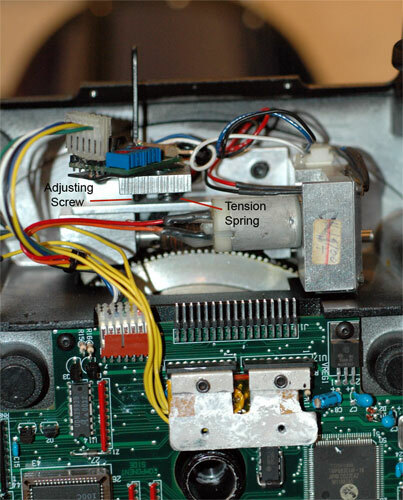 If the ribbon cable above is melted from the old capacitor burning out, repair can be a problem. 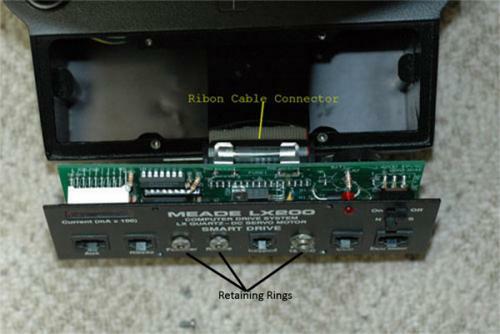 I do not know of anyone with a replacement ribbon cable. 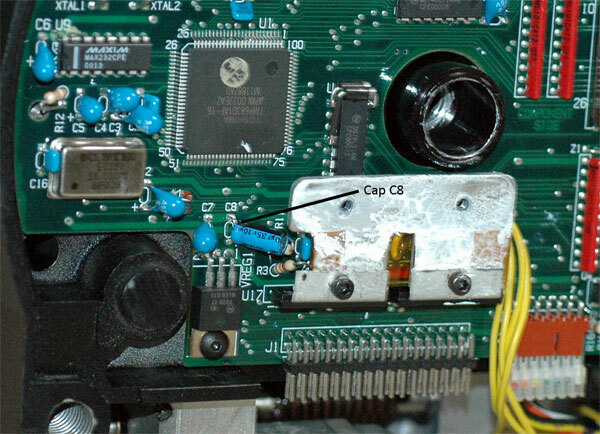 Naturally, the other capacitors on the motor and main circuit boards should be addressed. How about a look inside the base. It does not take much to separate the forks and base to check on the gears and bearings. All you need are a couple of hex wrenches. Remove the center cover plate from between the forks. Then remove the hex bolt and washer in the valley. After that it is just a matter of pulling the 2 apart. My 8" is easy to do alone. Larger scopes may need 2 people. 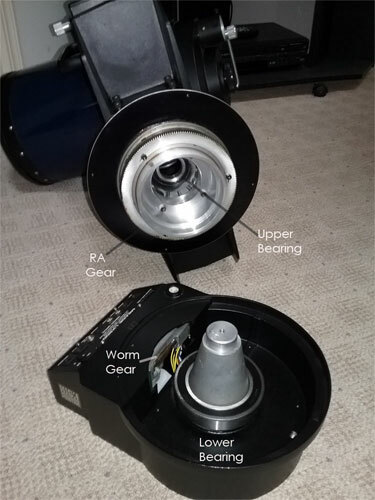 Now you have access to both RA upper and lower bearings, RA main and worm gears. It makes it easy to clean and lubricate as needed. Gently lower forks back on spindle while rotating lightly to engage worm and main gear. The hex screw and washer should be snug, not too tight. Adjusting worm and main gear play to be done later. The RA and Dec gear play can be adjusted. 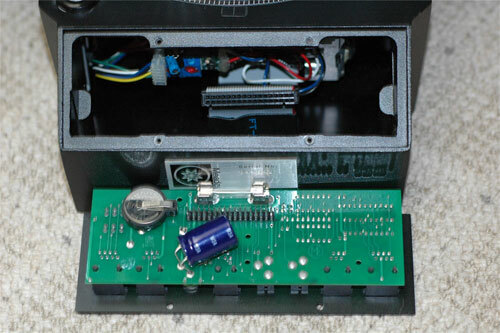 RA is doable by removing the control panel, but I find it helpful to also remove the base cover plate. Not bad on my 8", but again you would need at least 2 people for a 12". Undo the 4 screws holding the control panel. Pull the panel forward a little bit, then use a small screwdriver to remove the connector on the ribbon cable to free the control panel. This is a good time to replace the button battery. 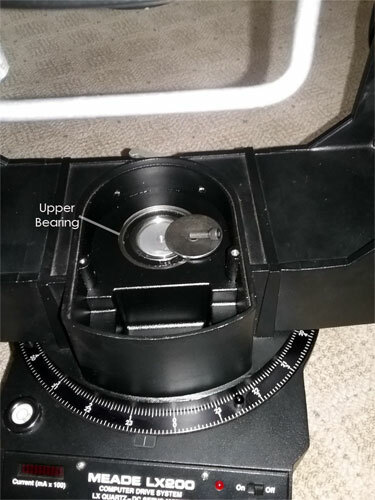 If you decide to open the base also, remove the 4 phillips screws and 2 smallest hex screws. Do not loosen the other 2 hex screws next to them. 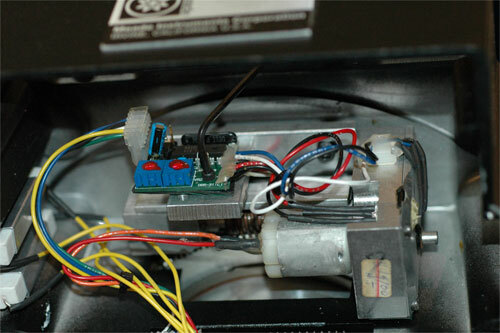 They hold the heat sinks to the circuit board. Nothing bad will happen if you undo them, it just isn't necessary. 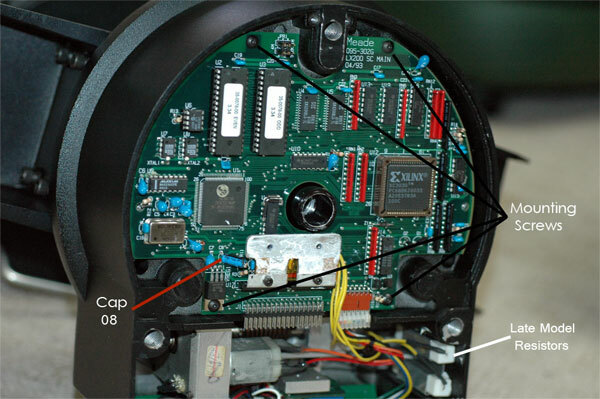 Now looking inside, and you can see the small circuit board on the RA motor assembly. Naturally the small hex screw to adjust the worm gear play is under this board. 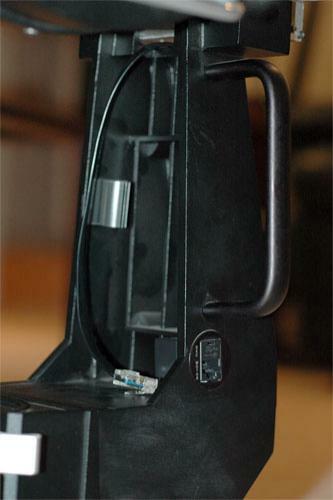 Loosen the hex screw a little and rotate ccw till you can access the hole for the adjustment screw. 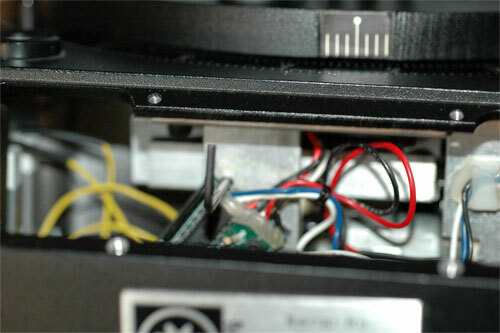 You can remove the hex screw if you like, make sure the small insulating rubber under the circuit board stays in place. In my slightly blurry picture, you can see the hex wrench inserted into the adjustment screw. Meade specifies 1/16" of play. Turn the wrench till you get a small amount of play when pushing the worm gear away from the main ring gear. Too much gap and you will have excess play and possible skipping. 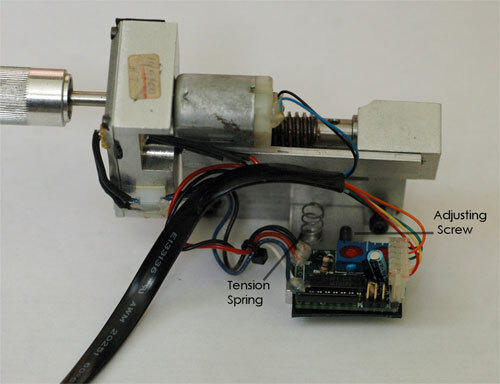 You do not want the gears to be snug against each other, too much friction will wear the gears and strain the motor. The last 2 pictures are the view with the bottom plate removed. Not necessary, but makes it a little easier. The Declination gears are easy. Unscrew the clutch knob and remove. Remove the hex screws holding the plastic cover. Now you have access to the Dec motor, gear, and clutch plate. 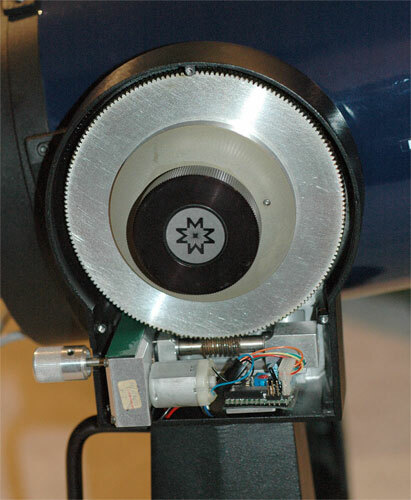 The declination motor is held in by 2 hex bolts. If you wish to remove it, undo the 2 bolts and disconnect the electrical connector inside the fork arm. 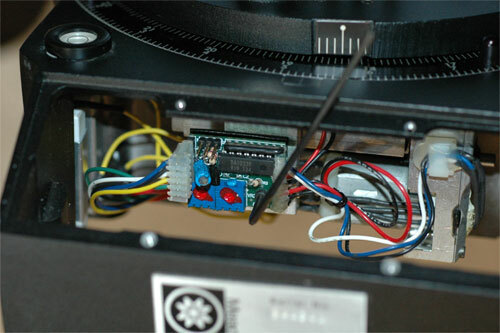 Use caution not to damage the small wires or led's for the encoders. Also be aware of the spring inside the hinge. The declination clutch plate and main gear can be removed for cleaning if desired. After cleaning and greasing, adjust play between worm and main gear. To set the gap, put the clutch knob back in so the main gear is snug. It can be difficult to get the hex key into the adjusting screw. You may be able to modify a hex wrench to adjust with assembly in place, but I did it the hard way. 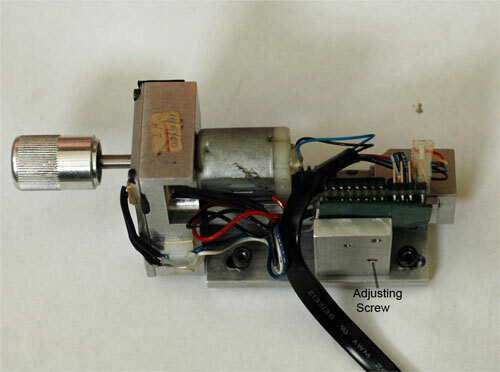 I tweaked the screw with the motor assembly out, install, check clearance, and repeat till 1/16" gap was reached. Be careful not to lose the small tension spring. When you are close, it only takes small turns to get it set. 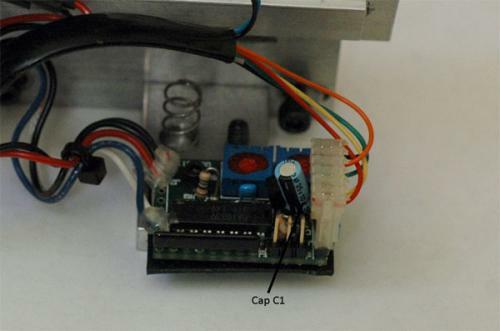 The problem capacitors with locations of the main culprits. Make sure any capacitors you change do not short out against the circuit boards. Use caution not to damage the boards when removing the old capacitors. C1 in the power panel, unscrew 3 retaining rings and separate the front cover. I ordered a motor and calibration board. Motor board will be a spare, but I wanted to try out the calibration board to check the potentiometers. I was going to try another method that uses a voltmeter and adjusting to 2.42 volts, but this calibration board seems a lot easier than trying to connect leads to the small pins on the motor boards. Both look well made. I used the calibration board to check the potentiometers and it works very nicely. 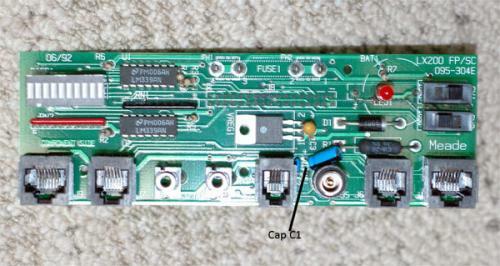 The leds indicate if any adjustment is needed and which way to turn it to get the board correctly set. If you give it a try, make small changes. I recommend marking the original positions of the pots before making any changes. It takes a very light touch on the adjustment screw. If you overturn, you may see a runaway, but a quick turn back and it will settle in again. On my original board with replacement capacitor installed there was a close fit, mainly due to the height of the capacitor I installed. The pin connector did not sit flush, but still made enough contact. I am very satisfied with these products. For the price, I find them very useful to replace a damaged motor board, and the calibration board is very helpful to make sure the board is tracking according to original design. Wow! Thanks, Ed, for this information! Thanks. I have to do something with the scope when spring rains keep it indoors. And since it has been raining lately, I decided to try the Peterson Engineering EZ Focus Kit. While it never bothered me much, it does take a bit of fiddling to get a sharp focus. There is a fair amount of play in the stock focuser. I ordered the kit, and it arrived soon after. It contained 2 roller bearings, a custom stainless washer, grease, allen wrenches, grease, and a bolt that is needed on 10" and up scopes. 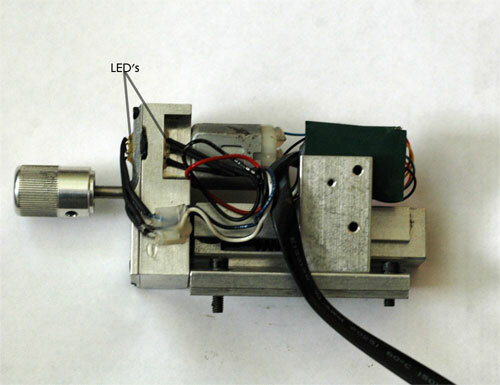 It is designed to eliminate the play from the nylon washers used in the stock setup. The directions are good, and installation went well. I was very happy with the results. 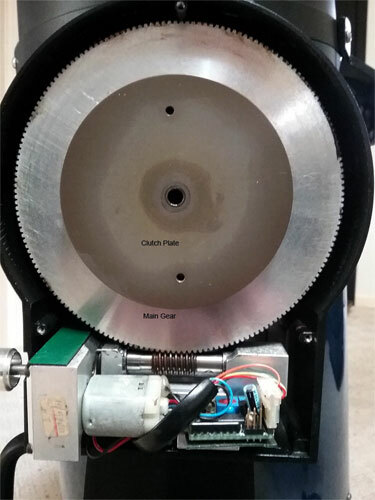 Movement of the focuser is very smooth, and almost all of the play was removed. It is a lot easier to bring things into sharp focus now. While not a requirement if you are doing visual, it was worth it to me. If you are into AP, then I would say definitely go for it.